Russell had a tough time getting enough players for just 2 Men’s teams in the first round of the Berkshire Summer League on April 7th, probably due to the proximity of Easter, and both teams found themselves facing strong opposition. Men’s 1 were at home against Wargrave 1 in Division 3B and were unlucky to lose the match by 3 games. James Brennan & John Phillips started well beating Jeremy Morgan & John Winston 6-4 6-3, while Matt Paxton & Chris Torkington had a battle against Colin Johnson & Paolo Pederoda just missing out in two toe-breaks to lose 6-7 6-7. Brennan & Phillips also found this pair a handful in the second round before winning 7-6 6-2, but Paxton & Torkington had nothing to offer against Morgan & Winston who had clearly upped their game following their defeat in the first round and romped home 6-0 6-1 to take the tie by 41 games to 38. Men’s 2 were also at home and they faced Royal Berkshire 1 in Division 4A. Richard McCully & Vince Brooks had a slow start against Philip Blincow & Christopher Occleshaw losing 0-6 3-6 and Steve Stow & Andy Stone couldn’t do much better against Sean Sweet & Paul Ibsen, losing 1-6 3-6. Both home pairs improved in the second round with McCully & Brooks losing 1-6 4-6 to Sweet & Ibsen while Stow & Stone did well to pick up a set against Blincow & Occleshaw despite eventually losing 2-6 6-4 0-1. With most of the Crowthorne players more used to playing in their 3rd team, is was a gutsy performance against a very strong side. The next weekend it was the turn of the Ladies and Lorraine also did well to find 8 players available on the last weekend of the Easter school holiday. Ladies’ 1 travelled to Caversham to play their 5th team in Division 5B having been relegated last season. Emma Knowles & Tina Stern crushed Erika Kazcur & Anna Bellingham 6-1 6-0 in the first round while Jenny Sheppard & Maddy Dunckley were losing a close match 4-6 5-7 to Tracey Poundall & Ruth Brooks. Knowles & Stern maintained their dominance in the 2nd round to beat Poundall & Brooks 6-1 6-1 but Sheppard & Dunckley pulled off the surprise result of the match to win 6-1 6-2 against Kazcur & Bellingham and secure all three points in a 3-1 win. Ladies ‘ 2 also had to travel but only as far as Shinfield to play their 1sts in Division 6A. Caroline Atkinson & Lorraine Fowler, both returning after injury did well to lose just 3-6 3-6 to Zelie Bailes & Kelly Guiver but Wendy Miles & Penny Hemingway couldn’t get a game against Anna Allen & Michelle Goulding. Miles & Hemingway could not improve on this performance against Bailes & Guiver and Atkinson & Fowler only managed to get one game against Allen & Goulding. However, congratulations to all four of the team for turning out against such strong opposition. Any club’s first team has the pick of their club’s players and our side were unlucky to face such a strong team in the first round. On Sunday morning our 18U Boys were away at Twyford and they had a rare victory by 2 rubbers to 1, although it was nearly 3-0 with Thomas Opalko losing a deciding tibreak. Thomas lost to Julian Brandon 6-4 1-6 0-1 in the singles but Owen Lawrence won 6-0 6-2 against Matthew Latimer. Thomas and Owen then won 6-4 6-2 in the doubles. The weekend finished with the first round of Berkshire Team Tennis, the competition that used to be sponsored by AEGON and involves 4 singles matches and 2 doubles. In the singles, who plays who is determined by the ratings of the players in the two teams so the top-rated player in each side play each other and so on down the ratings. 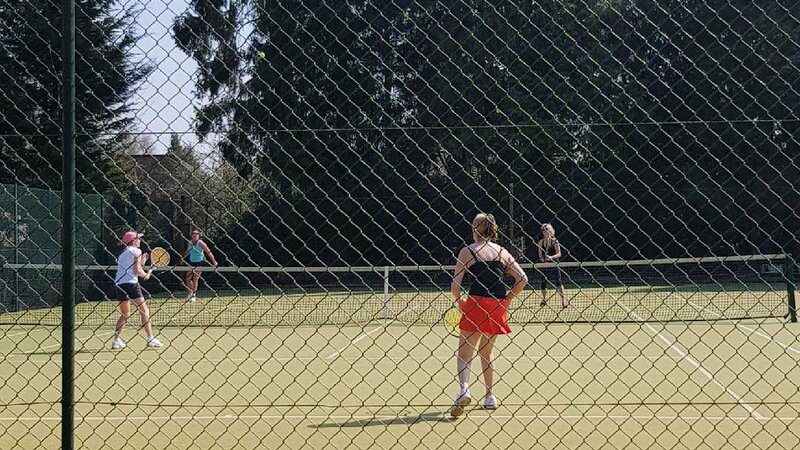 A strong Crowthorne 1 team entertained Windsor 2 at home in Division 2 and came away having won just a single rubber against a very strong side. John Phillips, playing at number 4, won 7-5 7-5 against Oliver Elston, while James Brennan, Jon Blatchford and Andy Sayer, playing at 1,2 and 3 respectively, all lost in straight sets, Brennan 3-6 1-6 to MariusBiedka, Blatchford 4-6 0-6 to Andrew Mustill and Sayer 1-6 1-6 to Luke Hughes. In the doubles, Sayer & Brennan lost 3-6 1-6 to Mustill & Biedka while Blatchford & Phillips lost 4-6 3-6 to Elston & Hughes. It was another strong foursome that represented the club in the Crowthorne 2 team who travelled to Windsor to play Home Park in Division 5A. In the singles, Matt Paxton, at no.1, battled well against Matthew Goff but lost 6-7 5-7, David Smith survived a close first set against Mark Shelmerdine to win 7-5 6-2, Russell Finch cruised through 6-1 6-1 against Paul Batty and Simon Usher won a deciding tie-break to win 7-5 5-7 1-0 against Luke Beckley. Shelmerdine & Goff then won another close rubber 5-7 7-5 1-0 against Smith & Paxton, the latter having played in three 7-5 sets and a 7-6 while Finch & Usher had a relatively easy 6-3 6-1 win against Batty & Beckley. So the final result was a win for the Crows by 4 rubbers to 2 but, with 3 very close rubbers involving the other three players, Finch had the easiest morning of them all! Please send some pictures of your match so we can include them in the Match Reports. Click if you still have questions?